The Falcon Eyes RCC-12 Rain Cover for SLR Cameras is suitable for any SLR camera and measures at 70 x 35cm and has openings on the left and right for your hands. If the camera is mounted to a tripod, the RCC-12 is equipped with a zipper on the bottom to enclose the top of the tripod. 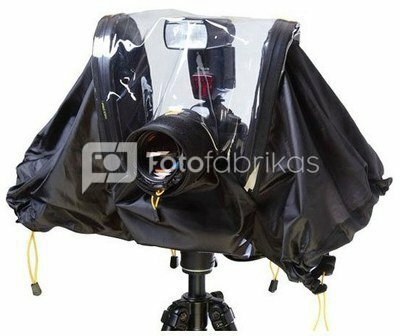 The top of the rain cover includes a transparent pane whereby a speedlite can be placed.